The human fossils still speak! The human fossil record is completely compatible with special creation. In contrast, the human fossil evidence is so contrary to evolution that it effectively falsifies the idea that humans evolved. Future fossil discoveries will not substantially change the picture because future discoveries cannot nullify the objective evidence already unearthed. This message is not what we hear from a hundred different voices coming at us from a dozen different directions. But the human fossils themselves tell the real story. I can best illustrate the situation by describing a project I have conducted a number of times in my college apologetics classes. Each student is to do research on several assigned fossils. Only fossils that are fully accepted as legitimate by the scientific community are included. The student is to spend a minimum of eight hours of research on each fossil. He must use only evolutionist sources. He is to determine the date the evolutionist has assigned to the fossil. He is to determine the category (australopithecine, Homo erectus, Neandertal, etc.) assigned to the fossil by evolutionists. He is to write a one-page paper outlining his findings and make copies for distribution to the class. The paper must contain at least five documented sources. The results have become quite predictable. After the first week, a number of students come to me complaining that they cannot find any agreement among evolutionists regarding the date or the category of their fossil. I could easily have told them about this situation in a class lecture, but it wouldn’t have had the impact upon them that their own research provided. Many important hominid fossils are the subject of intense controversy among evolutionists involving the date, or the category, or both. The two matters are sometimes related. 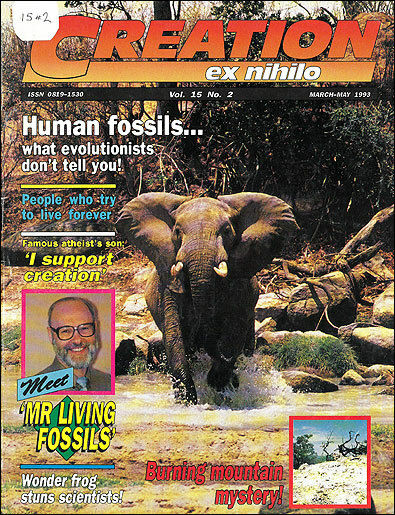 For evolutionists, the category to which they assign a fossil is sometimes used to arbitrarily determine its date, or the date of a fossil is sometimes used to arbitrarily determine the category to which it is assigned. This is not an unbiased approach in interpreting human fossils. I suggest to the students that they go with the two or three evolutionists out of the five they have consulted who may agree on the fossil in question. When I made the fossil assignments, I did not make them randomly. I purposely gave the more obscure fossils to students who I knew were good at research. However, after about two weeks, members of this group began coming to me. They complained that they were not able to find anything on a particular fossil. Besides using our own college library, they often checked several of the large state university libraries in our area. More than one student suggested that there was no such fossil as the one I had assigned. Laughingly, I was accused of sending them on a wild-goose chase. Their experience was what I had anticipated. I wanted them to discover first-hand that there are many legitimate fossil discoveries about which it is very difficult to obtain information. When I was satisfied that the student had spent at least eight hours in searching for information on a particular fossil, I would give him copies of the materials in my own file on that fossil so that he could write his report. He could not possibly duplicate my 25 years of research on the human fossils in the time allotted. I do not wish to imply that the difficulty in finding material on many of the human fossils represents some kind of evolutionist plot. What happens is that only the most sensational fossil discoveries receive much publicity. Most discoveries are reported in some scientific journal and then forgotten by all but a very few experts. The fossils mentioned in most popular presentations of human evolution represent just a small portion of the total fossil material that has been uncovered. As the students prepared to write their reports, a third group comes to me. Because of the conflict they see between the shape (morphology) of their fossil and the assignment given it by evolutionists, they have questions. Because there is an obvious conflict between the shape of some fossils and their category assignment by evolutionists, I encourage the students to go by the shape of their fossils, as documented by evolutionists themselves, in making their assessments. That is the way paleoanthropologists are supposed to do it. Then comes ‘F’ Day—Fossil Day! The students bring their reports to class and place their fossils on the master chart according to the evolutionist dating. As the process takes shape, it becomes very apparent that the human fossils do not show evolution over time. In fact, it is obvious that the fossils themselves falsify the concept of human evolution. Regarding this exercise, some people ask me, ‘Aren’t you taking quite a chance? What if the exercise doesn’t always work out that way?’ In spite of the ambiguities in many of the fossils, because of the very large number of fossils involved, the over-all testimony of the human fossils is very clear. It always works out that way! In this exercise, the stark reality of the human fossil record hits the student with greater force than anything I could have said. The key in this exercise is to study all of the relevant fossil material and to place it all on a ‘time chart’. Besides more than 300 Neandertal fossil individuals, this material includes more than 49 fossil individuals in the archaic Homo sapiens category, more than 220 fossil individuals that can properly be classified as Homo erectus, and more than 63 fossil individuals that are indistinguishable from modern Homo sapiens and are dated by evolutionists from 30,000 years all the way back to 4.4 million years in the past. It is no accident that evolutionist books seldom include charts listing all of this material. For example, one of the more recent texts (1989) on the human fossils is by University of Chicago professor Richard G. Klein.2 In his 524-page work, Klein has 20 different charts dealing with various aspects of the human (hominid) fossil record. Yet, there is no way a student could get the over-all picture. The student would simply have to accept by faith Klein’s thesis that the fossils demonstrate human evolution. The one chart that would most interest students—a chart showing all of the relevant fossil material mentioned above—is not to be found anywhere. By this type of omission, the true nature of the human fossil record continues to be the best-kept secret in modern paleoanthropology. Black, Becky A. Sigmon and Jerome S. Cybulski, eds., University of Toronto Press, Toronto. 1981, pp.79-80. Richard G. Klein. The Human Career: Human Biological and Cultural Origins, University of Chicago Press, Chicago, 1989.